Acts: Beginning at Jerusalem by Steven Charles Ger. Messianic. You will receive power when the Holy Spirit has come upon you; and you shall be My witnesses both in Jerusalem, and in all Judea and Samaria, and even to the remotest part of the earth. Every so often, a commentary comes to the attention of the student of Scripture that strikes him or her as being head and shoulders above the crowd. Steven Charles Ger's Acts: Witnesses to the World has struck this editor and AMC's board secretary Mottel Baleston in just such a way. In fact, as I carefully read through the text for editing purposes - which includes no change in the text - I find myself engaged and absorbed not merely as an editor, but as a student. For these reasons Mottel and I have decided to present Acts in its entirety - not just for the wealth of information that may be gained from its study, but, as Mottel stated, as a model for how a Bible study ought to be done; so be on the lookout for an Acts segment in each Shofar for many editions to come. Links to previous increments of Acts: Witnesses to the World may be found in our Library. To gain the most from this study, it is suggested that the Scripture portions whose references are provided in the headings be read prior to considering Steve's comments on them. ~ editor. The early church did not have long to wait for the impending events that Jesus, in His final commission, had prepared them to expect. He had told them to anticipate the outpouring of the Holy Spirit, which would be characterized by their being baptized in the Spirit. As a result of that Spirit baptism, they would then receive power to proclaim their witness. In this next chapter, Jesus’ promises were fulfilled. Ten days following Jesus’ ascension, while in the Temple courts at the festival of Pentecost, the apostles were baptized with the Holy Spirit and boldly proclaimed before the assembled nation of Israel that Jesus is both Lord and Christ. On Sunday, May 24, 33 AD, ten days following the ascension of Jesus, the festival of Pentecost had arrived. Luke begins this chapter with a bold proclamation that during this year’s celebration of Pentecost, the festival had been fulfilled. In Acts 2:1, he purposely chose the term sumpleroo, which means to “completely fulfill,” indicating that what he is about to relate is the prophetic consummation of this Biblical feast. Pentecost. The Feast of Pentecost, or the Hebrew Shavuot, marks the anniversary of the giving of the Law to the Jewish nation and celebrates the theophany, or God’s appearance, at Mount Sinai. Following the events of this chapter, Pentecost will also forever mark the granting of the Spirit to Jewish believers and celebrate their indwelling on Mount Moriah, the Temple Mount. Pentecost is one of the “big three” pilgrimage festivals when, as during Passover and Tabernacles, every Jewish male is commanded to worship at the Temple in Jerusalem (Deut 16:16). In Deut. 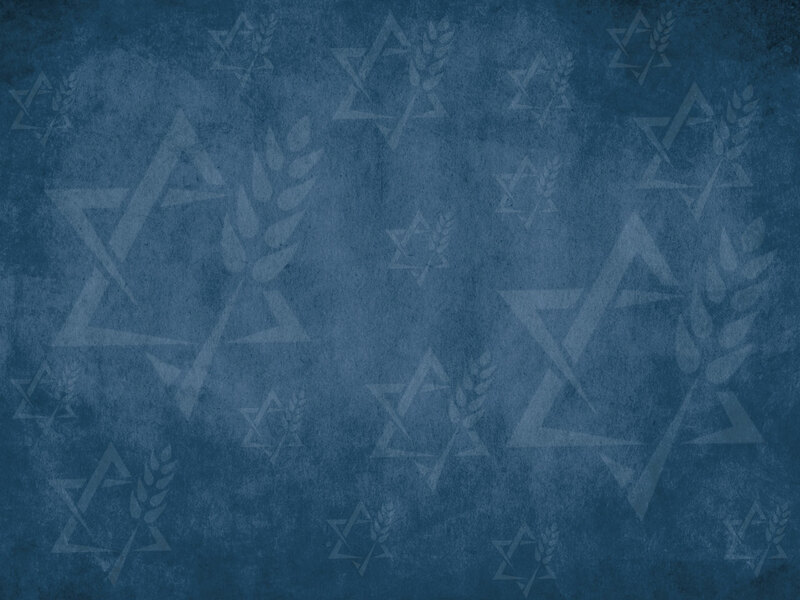 16:9-10, the holiday is designated as Hag Hashavuot – “The Festival of Weeks.” This name, Shavuot, was so designated because seven weeks, or fifty days, are counted down from the week of Passover until the arrival of this holiday. Pentekoste, Greek for the number fifty, was used interchangeably with the Hebrew Shavuot . At the conclusion of this fifty-day countdown, each family brought an offering of two loaves of wheat bread to the Temple, baked from the firstfruits of the wheat harvest. These leavened loaves were to be waved before the altar of the Lord (Lev. 23:15-22). It is important to note that these loaves, being leavened, were neither burnt nor offered on the altar; this would have violated the staunch prohibition against the offering of leaven, which represents sin. In fact, some hold that these leavened loaves were representative of the worshippers’ sinfulness. “Saturday.” According to this method, Pentecost would always fall on a Sunday. Therefore, although the specific day of the week, Sunday, was always fixed, the calendar date would shift from year to year. Alternatively, the Pharisees interpreted the term ‘Sabbath’ in a specialized sense, understanding it as a reference to the Festival of Unleavened Bread, which occurred on the Jewish calendar date Nisan 15. Obviously, the day that followed Nisan 15 was always Nisan 16. Therefore, Pentecost, coming fifty days later, would always fall on the fixed date of Sivan 6. Utilizing their preferred method, the Pharisees removed all the ambiguity as to the specific annual date on the Hebrew calendar, although the day of the week would shift from year to year. During the events of the gospels and Acts, the Sadducees were in control of Temple worship. Therefore, their system of determining Pentecost’s date was in place, making the events described by Luke fall on a Sunday. Later, following the destruction of the Temple in 70 AD, the Pharisees’ religious judgments became determinative in Judaism, and their methodology was employed. Although not specified in Scripture, Pentecost also came to be commemorated as zman mattan toratainu, “the season of the giving of our Torah,” the day on which the Torah was given to Israel. In fact, the central Scripture reading for this holiday is the passage that records God’s giving the Torah to Israel and entering into the Mosaic Covenant with them at Mount Sinai (Ex. 19–20). The events described within this passage of Exodus, and those events that immediately follow, provide the foundation for what will be fulfilled in Luke’s narrative. Moses’ prolonged absence, the people built themselves a more tangible, far less traumatic representation to worship -- a golden calf (Ex. 32:1). When Moses returned, he condemned the nation for their grievous sin. In holy indignation, he destroyed the two stone tablets containing the Ten Commandments (Ex. 32:19). He instructed his own tribe, the Levites, to kill the idolaters. The Levites struck down three thousand Israelites before God mercifully restrained them from decimating the nascent nation (Ex. 32:26-28). The events of Pentecost described by Luke in this chapter, some fifteen hundred years after the Sinai experience, are the God-directed sequel to the foundational events related by Moses. Luke records that at about nine o’clock on the morning of Pentecost, the twelve apostles were gathered together in one place. There is some disagreement, however, regarding exactly where the “one place” was in which they were gathered and in which the awesome manifestations of the Spirit’s visitation are experienced. assumption. Indeed, Acts 2:2 uses the term “the house” to describe their location. However, if this is the case, and the “one place” of Acts 2:1 is the upper room, it is difficult to explain why Luke provides no transitional description which maneuvers the apostles out of the house, through the city streets and into the Temple complex, where they are positioned by Luke in Acts 2:5. A more likely interpretation of the “one place” where they are assembled is the Temple courts. The term “the house” was customarily used in reference to the Temple (Acts 7:47). Furthermore, where else would every Jew in Jerusalem be on this festive day of pilgrimage and celebration, but gathered in the Temple courts awaiting a wonderful communal festival meal, an international Jewish picnic. Most likely, the apostles, together with the other one hundred and eight believers, were in the area of the Temple known as Solomon’s Portico, or Colonnade, a favorite spot of Jesus’ (John 10:23) and, later in Acts, of the apostles (Acts 3:11; 5:12). Placing the events of Acts 2:1-4 in the Temple courts also answers the difficulties mentioned above of physically positioning the apostles from the upper room to the Temple. Furthermore, Acts 2:15 specifies that these events occurred at around 9:00 AM., which was the designated time of prayer. One cannot imagine that the apostles would have been anywhere else but the Temple on a festival day at the hour of prayer! Another interpretive disagreement stemming from these opening verses is the identity of the recipients of the supernatural manifestation of tongues in Acts 2:1-4. To which group does the “all” of Acts 2:1 refer? As with the location, there are two choices here as well. supernatural empowerment that morning was only granted to the twelve apostles. First of all, the antecedent group, or previous referent, were the Twelve (Acts 1:26). It must be remembered that what Luke originally wrote had no chapter divisions or headings, and what he mostly likely meant by “all” was the newly reconstituted group of the Twelve, his previous subject. Second, the tongues-speakers were identified in the text as Galileans (Acts 2:7). This clearly referred to the apostles, who were all Galileans, and not the larger group, who probably hailed from a variety of locations in Israel. Furthermore, Peter, with the eleven other apostles, responded to their being singled out by the crowd as drunkards (Acts 2:14). In the next verse, Peter specified that “these men” were not drunk. Since the group of the one hundred and twenty contained both men and women (Acts 1:14), and Peter assuredly did not mean to say that “the men were not drunk but the women were,” then only the apostles could have received the gift of tongues in Acts 2:1-4. Third, Luke indicates throughout the Acts narrative that the gift of tongues was given for the purpose of authenticating the apostolic calling, office and witness. Each of the four recorded instances of tongues speaking in Acts served this authenticating purpose, either through the apostles’ exercise of the gift at Pentecost (as in 2:1-4) or through “echoes” of the initial Pentecost experience as each new group category believed the apostolic message and received the Spirit (8:14-17; 10:44-47; 19:1-7). Acts 2:2-4 describes strange, supernatural manifestations that suddenly and rapidly envelop the disciples. As the apostles were gathered among the relaxed and joyous crowds in the Temple complex, a noise resembling a violent wind, one that was heard but not felt, suddenly filled the Temple. In the Hebrew Scripture, wind, ruach, the same Hebrew word used for “spirit,” is a common symbol of the Holy Spirit. One prominent example is the reassembling and resuscitation of the valley of dry bones in Ezekiel 37, where the wind represents the Spirit of God, the prophesied instrument of Israel’s national restoration. This was followed by a supernatural pyrotechnic display. A sizable mass of something resembling fire appeared, clearly visible yet not physically felt, which then began swiftly dividing and cutting itself up in pieces, distributing one “tongue” of fire to rest upon each of the apostles. The Holy Spirit, the Ruach Hakodesh, had dramatically arrived. Luke’s description of this manifestation resembles the description of God’s Shekinah glory manifest on Mount Sinai (Ex. 19:18) and filling the Temple upon its dedication (2 Chron. 5:14). The Holy Spirit was once again gloriously manifesting Himself in the midst of Israel. Philo, the first century Jewish historian, in describing the giving of Torah at Mount Sinai, emphasized both the fire of God and the language of God in communicating His will to His people. This was a direct fulfillment of John the Baptist’s prophecy that the Messiah would baptize with the Holy Spirit as well as with fire (Matt 3:11). This also fulfilled Jesus’ promise, given some seven weeks earlier on Passover at the Last Supper, that He would send the Comforter, the Teacher (John 14:26; 16:7-15). Additionally, this was the empowering event that Jesus had told His apostles to anticipate (Acts 1:4-8). The pouring out of God’s Holy Spirit on Pentecost would have been profoundly appreciated by Jewish recipients. The anniversary of the divine gift of Torah was the most eloquent of moments for the revelation of the divine Spirit. This was indeed the logical sequel to the Sinai experience. The God who came near on Sinai had now come ultimately near as He indwelled believers with His Spirit. The Spirit’s presence at Pentecost was marked by three similar signs also experienced at Sinai: violent wind, fire, and supernatural sounds. In Acts 2:1-3, Luke described the wind and the fire. In 2:4, Luke will begin his description of the “supernatural sounds” of this Pentecost. The result of this outpouring of the Spirit was the apostles’ newly acquired supernatural ability to communicate “with other tongues;” in known, intelligible spoken languages. What Luke means when he relates that “the Spirit gave them utterance,” is not that the Spirit Himself is speaking, but that He is providing their ability to speak. From this point on, the apostles would be empowered to be the witnesses whom Christ had commissioned. On this Pentecost, it can be said that there was indeed something new under the sun! Those Pentecost worshippers were witness to the birth of the church, the beginning of a new era. From this point on, all believers would be permanently indwelt by the Spirit, forever united with Christ and each other. Filling and baptism. The “filling” of the Spirit is not synonymous with the “baptism” of the Spirit. Although Luke combined them in Acts 2:4, these are actually two distinct ministries of the Holy Spirit. Although only the “filling” of the Spirit is specifically mentioned here, the “baptism” of the Spirit was also simultaneously taking place. Luke does not use the specific technical term, “baptism of the Spirit” in Acts 2:4 to describe these events, substituting instead a description of the apostles being “filled” with the Spirit, which emphasizes the controlling aspect of the Spirit’s ministry. However, this event would subsequently be recognized by the apostles as the fulfillment of what Jesus had promised would take place within a few days’ time (Acts 1:5) as well as the inauguration of the Spirit’s ministry of baptism, indwelling and filling (Acts 11:15-16). The filling of the Spirit refers to being under the control of the Spirit (Eph. 5:18), resulting in a holy lifestyle of mature spirituality as well as empowerment for ministry (Acts 2:4; 4:8, 31; 9:17; 13:9). In Acts, the primary ministry the Spirit is shown empowering is that of evangelism, witnessing of the Messiah. It is a repeatable event (Acts 4:8, 31; 6:3-5; 7:55; 9:17; 13:9, 52) that both Old and New Testament believers experienced, although it was much rarer in the Old Testament (Ex. 31:3; 35:30-34; Num 11:26-29; 1 Sam. 10:6-10). Believers cannot generate the filling of the Spirit, but they can and should purposely yield themselves to the filling of the Spirit (Eph. 5:8). The primary result of the Spirit’s filling in Acts is empowerment for effective ministry. In contrast, the primary result of the baptism of the Spirit in Acts is organic union with Christ and His Church (1 Cor. 12:13). It is a onetime, non-repeatable event in which each new believer is supernaturally united with Jesus and joined together with every other fellow believer. This organic union occurs at the moment of trusting Christ as Messiah (Rom. 8:9; 1 Cor. 12:13). This is not an experience one can either yield to or resist. One cannot actively trigger spirit baptism; one may only be the recipient of the sovereign work of God. The ongoing consequence of Spirit baptism is that believers subsequently experience the unending, continual indwelling of the Holy Spirit (John 14:16; 1 Cor. 6:19). Scripture records three atypical examples of Spirit baptism occurring at a significantly later time than initial belief. All fall within the Acts narrative (Acts 2:1-4; 8:17; 19:6). These instances, however, serve respectively to authenticate the ministry of the apostles (2:1-4), authenticate Samaritan salvation (Acts 8:17), and authenticate the ministry of Paul (Acts 19:6). 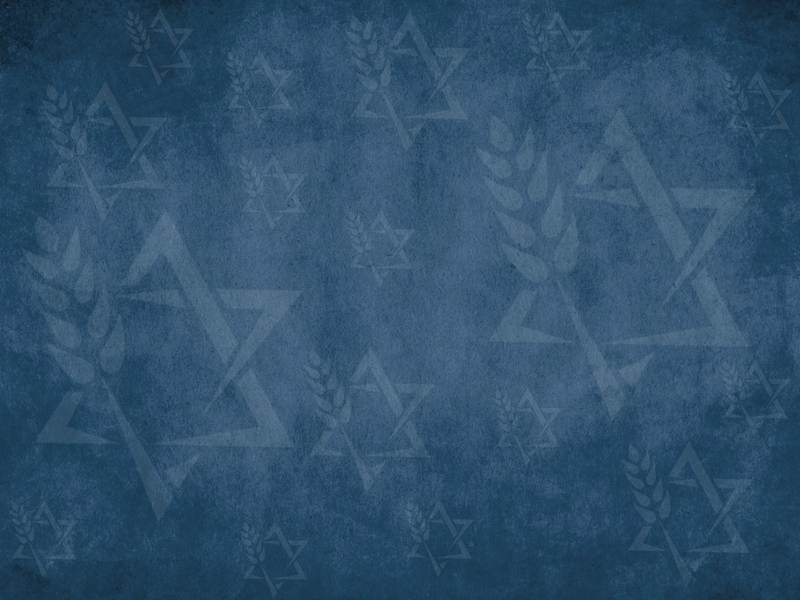 the four recorded episodes of tongues speaking is before a Jewish audience (Acts 2:4-11; 8:17; 10:46; 19:6). Later, Paul elaborates that the gift of tongues was the fulfillment of the prophet Isaiah’s depiction of an authenticating sign for the Jews (Is. 28:11; 1 Cor 14:21-22). Since every person in the Temple crowd, including the apostles, could normally converse in Aramaic, Hebrew or Greek (and most were conversant in two out of the three languages), then the purpose of speaking in tongues at Pentecost could not have been to facilitate communication between the apostles and the crowd. The apostles’ speaking in a multiplicity of languages would neither have added to their efficiency nor the crowd’s edification. The gift of tongues at Pentecost had the sole purpose of serving as a colossal beacon to the gathered multitude that God Himself wanted their attention. There was something vital of which He wanted them to be aware. In the entire narrative of Acts, it is only in the apostles’ initial ministry to the Jews (Acts 2:1-4), Samaritans (Acts 8:17), Gentiles (Acts 10:44), and transitional believers (Acts 19:6) that the phenomenon of tongues is experienced. This is strong indication that, at least within Acts, tongues was a sign given by God to authenticate a new work of salvation (Heb. 2:4). It was, therefore, limited to the initial outpouring at Pentecost plus the three separate “echoes” of Pentecost that follow, as old boundaries were newly broken through by the Spirit. 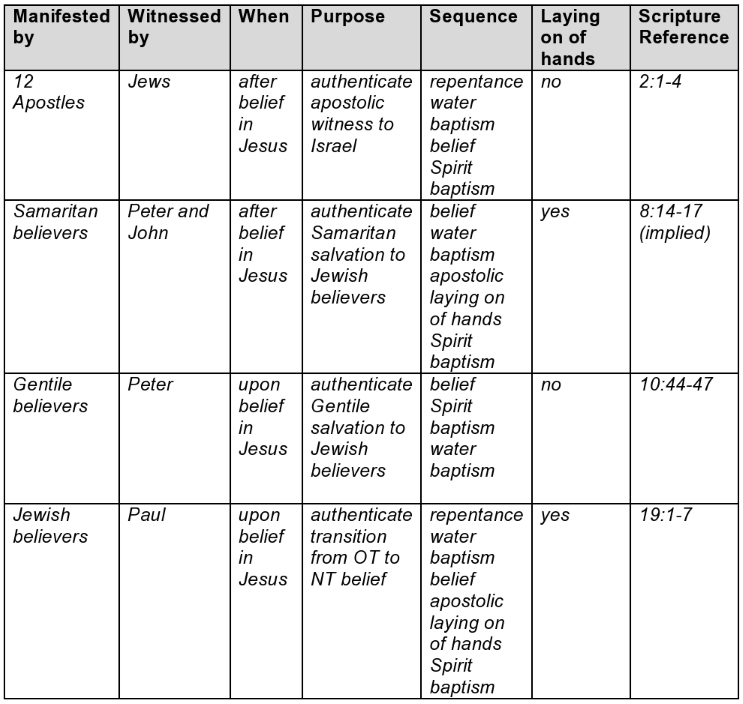 It is of note that in none of these four special instances was the gift of tongues an indication of a “second” or “additional” Spirit baptism,” or a “second work of grace” (see Table 8). As Pentecost was a pilgrimage festival, the Temple was filled to overflowing with huge crowds of pilgrims from all over Israel and the Jewish diaspora as well as the cosmopolitan residents of Jerusalem. Due to the difficulties and expense of travel to Jerusalem, particularly for those who lived outside the land of Israel, vast numbers of Jews stayed in Jerusalem for the fifty-day period between Passover through Pentecost. This was the only two-month period in the year when the holy city would be packed with so many people. Therefore, this period was particularly strategic for facilitating the news of Jesus’ crucifixion and resurrection as well as for the apostolic witness. Luke described the wind and fire as occurring with such rapidity that by the time anyone other than the apostles or their comrades noticed them and turned their heads to look, they were already gone. Yet if most of the Temple crowd missed the initial rush of the Spirit’s coming, the result of His visitation, the empowered apostolic utterance, was inescapable. Luke specified that the crowd was composed of particularly “devout” Jews. These were part of Israel’s faithful believing remnant, written about later by Paul (Rom. 11:5). Since they were faithful to the revelation that they had heretofore received from the Hebrew Scriptures, they would naturally prove responsive to this new revelation. They came rushing over to hear Peter and the apostles speaking in a multiplicity of dialects. Luke reports the crowd’s response. At first the crowd was bewildered (Acts 2:6). Their bewilderment grew to amazement and astonishment (Acts 2:7). The apostles were speaking in the “mother-tongues” of many diaspora Jews. One can only speculate as to what the actual content was that the apostles were proclaiming in these various languages! All Luke records is that the apostles were extolling God’s greatness and speaking of His “mighty deeds” (Acts 2:11). Whatever it was that they were so animatedly and enthusiastically proclaiming, the crowd recognized them as being Galileans. In first century Israel, Galilee was considered to be the boondocks of Israel, and Galileans were considered to be uneducated, country bumpkins, with strong, guttural accents (Matt. 26:73; Mark 14:70; Luke 22:59). Apparently, whether speaking in tongues or not, the apostles retained their accents! The crowd would naturally have wondered how they were able to speak so many foreign languages with such fluency. There is an ancient rabbinic legend in the Midrash, which states that as God gave the Torah to Israel at Mount Sinai, all nations throughout the world simultaneously heard God's voice in their own languages. Similarly, on Mount Moriah that morning, as Peter and the apostles preached, Jews from all the nations heard the word of the Lord in their own languages. This, however, was no legend. The crowd contained representative Jews from a variety of diaspora nations and regions. Luke’s selected representative list of visitors sweeps like a compass around Jerusalem, the geographic center of the Jewish diaspora as well as the Roman Empire, (16) from east to north to west to south, and includes visitors from the regions of Persia (Acts 2:9), Asia Minor (Acts 2:9-10), North Africa (Acts 2:10), Europe (2:10-11) Arabia (Acts 2:11), and, of course, Israel (Acts 2:9). When Luke mentions the Roman contingent, however, he pauses to particularly specify that this group contained both Jews and proselytes, Gentiles who had converted to Judaism (Acts 2:10). Perhaps Luke is foreshadowing the eventual climax of the Acts narrative in Rome, or it is possible that members of this Roman contingent, subsequent to Pentecost, were the founders of the Roman church. Having listened for some time now to the apostles’ dazzling display of linguistic fluency, the crowd was, by now, thoroughly confused and simply did not know what to think. Luke writes that they were “amazed and greatly perplexed.” In other words, they were flummoxed, and the crowd’s response was mixed. One group responded with intense curiosity. They seem to have recognized that there was a miracle occurring right before their eyes, or ears in this instance, and they pondered its meaning and significance (Acts 2:12). A second group exhibited an opposite response. They scoffed and mocked the apostles, accusing them of being too enthusiastic in their consumption of new, or sweet, wine. In other words, they accused the apostles of being drunk (Acts 2:13). “Sweet” or “new” wine was the very sweet and highly intoxicating batch of wine that had not yet completed the fermentation process. Drunkenness was frowned upon in ancient Jewish culture, so an accusation of drunkenness, particularly so early in the morning and in the Temple on the festival day, would have been a particularly derisive accusation. speaking articulately in languages that were understood by the crowd, so simultaneous ecstatic utterances cannot be in view. Rather, it perhaps should be assumed that the intensity of this inaugural Spirit baptism proved to be slightly overwhelming to the apostles. Just as experiencing God had been overwhelming for the Israelites at Mount Sinai (Ex. 20:19), the outpouring of His Spirit may have been a bit shocking to the apostles’ frail and limited human nervous systems. 1. Describe how the Jewish feast of Pentecost was fulfilled in Acts 2. 2. Who spoke in tongues in Acts 2:1-13? What is the basis of your answer? Book of Acts,” Bibliotheca Sacra (Dallas Theological Seminary, 120:480, Oct. 1963), 309ff. Acts in its First Century Setting, vol. 4: Palestinian Setting (Grand Rapids: Eerdmans, 1995), 417-419. Steven Charles Ger, Th.M., is a fourth generation Jewish believer. In addition to Acts: Witnesses to the World, his body of work includes a biblical commentary on Hebrews and co-authorship of The Popular Bible Prophecy Commentary. He is also a contributing author to The Gathering Storm and the Zondervan KJV Commentary: Old Testament. He is the former host of the weekly radio show, "The Jewish Heart of Christianity," and has appeared as a guest expert on both radio and television. Steven's main work is directing Sojourner Ministries, an organization dedicated to exploring the Jewish heart of Christianity. Steven has led 11 tours to Israel and has done on-site research in the actual locations found in the Book of Acts. Autographed copies of Acts: Witnesses to the World may be purchased from the Sojourner Ministries website at www.sojournerministries.com.